Youth Education in the Arts which includes the Cadets Drum and Bugle Corps and the US Scholastic Band Association is looking to add members to its administrative staff. Open positions include USSBA accountant and USSBA administrative assistant. 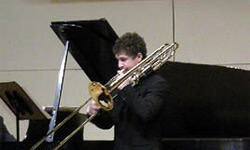 Carolina Crown member Weston Olencki recently competed in the 2008 Eastern Trombone Workshop National Classical Solo Competition in Washington DC. Olencki, who is a second-year member of the corps, took second place as a finalist in the competition. 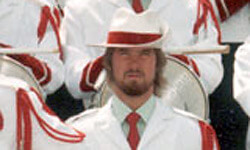 Read more on CarolinaCrown.org. 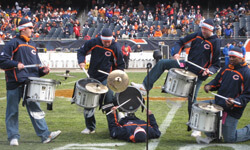 The Chicago Bears Drumline which provides game-day entertainment for all of the Bears' NFL home games will be holding open auditions on May 17 in downtown Chicago. Originally presented by the Cavaliers, previous members of the group have included alums of the Cavaliers, Star of Indiana, Madison Scouts, Phantom Regiment, Glassmen and Pioneer. Learn more on ChicagoBears.com. The Glassmen will be performing this weekend as part of the finale of the Toledo Symphony Orhestra's 65th anniversary concert. As part of the celebration, the corps will host a pre-concert reception for family, friends and drum corps fans. Read more on Glassmen.org. The Jesrsey Surf will look to Chris Garten, a junior bassoon and music education major at Shepherd University, and Alison Baier, a first-year history major at Rutgers University, to lead as drum major and assistant drum major during the corps' 2008 season. Both are third-year members of the corps. Read more on JerseySurf.org. On Saturday, April 26, the Madison Scouts will host the eighth annual "Rockin' For a Cure" benefit in support of Amyotrophic Lateral Sclerosis (ALS), also known as Lou Gehrig's disease. The annual event which brings together Scouts' alumni, friends and supporters, is the dream of Madison Scouts alum and instructor, Steve Weekes, who passed away from ALS in January of 2005. Read more on RockinForACure.org. Spirit's brass caption head Dr. Ray Vasquez will present an educational session at the upcoming Alabama Bandmasters Association All-State Band Clinic titled, "The Outdoor Activity: A Look at the Drum Corps Activity From a Horn Players Standpoint. An Explanation of Techniques, Methods, and Current Practices." According to the corps' Web site, the session will detail the various practices of the drum corps activity through the eyes of a former member and current instructor. 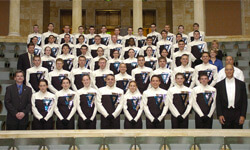 Read more on SpiritDrumCorps.org. The Vanguard Cadets posted an audio excerpt from their 2008 production "Perspectives" to share with corps alumni, parents and fans. The "all-original" music is being written by composers James Peterson and Robby Elfman. Listen to the clip on SCVanguard.org.